IoT 2017 goes down as the year in which there were more connected IoT devices then connected non-IoT devices. That means that there are now more connected cars, meters, machines, wearable devices and similar IoT endpoints than there are PCs, laptops, tablets, and smartphones. Exact numbers and estimates vary but the consensus is that there are now close to 8bn IoT devices in use and around 7bn non-IoT connected devices. The general interest in IoT technology seems to approach its peak. The Google Trend graph showed a sharp increase throughout 2015, another increase in the year 2016 but a fairly flat line for IoT 2017 (see red line in the picture below). Other (related) technology terms such as Blockchain, AI, or Autonomous Driving stole the show in 2017. In our view, the stable, high interest in IoT shows the topic has gained global relevance. However, IoT was not able to produce as many new revolutionary concepts in 2017 like some of the other above-mentioned technologies did – which is why overall interest did not explode further. Chicago-based Uptake is on an extremely fast investment track. The startup closed two funding rounds in 2017 for a total of $207M: A $90M Series C in April followed by a $117M Series D in November. Founded in 2014, the startup is now valued at around $2B and employs close to 1,000 employees. Most of these employees are young data scientists and software engineers that the firm hopes will turn Uptake into the data analytics hub for the industrial Internet of Things. The company has seen some negative press lately, though: Some experts see similarities with the rise and fall of Groupon, which Uptake CEO Brad Keywell co-founded in 2007. The main issue at this point: Uptake does not appear to have a killer product that could be scaled across organizations – something one would expect from a tech firm valued at $2B after 3 years of existence. Early minority investor and customer Caterpillar, ended its investment in November and announced to refocus “its areas of cooperation with Uptake”. Caterpillar did not comment further on the reasons for its move. A second firm with a similar growth story is Japanese-based Preferred Networks. The firm, also focuses on Analytics/AI for IoT and, like Uptake, was also founded in 2014. In 2017, Preferred Networks received a combined funding of $172M, led by the industrial giants Toyota Motor Corporation and Mitsui&Co. A key theme for us at IoT Analytics back in 2016 was the move from “hype to reality”, i.e. the industry realized that the actual number of successful IoT implementations is much lower than initially thought. In IoT 2017, a hotly debated study further validated that observation: In May 2017, Cisco published the results of a comprehensive survey that found that “close to 75% of IoT projects are failing”. The study sheds light onto what we, at IoT Analytics, call the “big 4 IoT inhibitors to massive IoT adoption”: Missing interoperability, lack of comprehensive security, unclear privacy, and uncertain ROI. For IoT to enjoy much larger adoption we will need to see advances in all four of those areas. Cloud backends (IaaS) are crucial for IoT deployments. That is why both Amazon and Microsoft added a number of new features to their IoT cloud offerings in 2017. Microsoft for example launched Microsoft “Azure IoT Edge” that allows for small devices to run cloud services even when not connected to the cloud. In a similar move, Amazon announced further device management and device security features at their re:event show in November 2017. A new giant joined the party in 2017: Google. In a much anticipated move, Google launched its “Cloud IoT Core” service in May 2017, allowing for easier registration of IoT devices to the cloud as well as a “protocol bridge” that natively supports typical IoT protocols. While Google’s IoT feature set seems to be smaller than that of Amazon and Microsoft at this point, Google’s move into “IoT cloud” is a sign that all major providers of cloud infrastructure have now realized that IoT operations require a different set of tools & services compared to their legacy cloud offerings. IoT 2017 saw the beginning of a new connectivity technology roll-out: Narrow-Band IoT (NB-IoT). The technology is the regulated (licensed) answer to unlicensed LPWA technology such as Sigfox or Lora. Like those unlicensed technologies, NB-IoT is a new connectivity standard tailored to remote devices that require a battery. NB-IoT is backed by many large telecom operators around the world which is why a large scale adoption is almost inevitable. In June 2017, Deutsche Telekom emerged as one of the first operators to officially launch their NB-IoT service (in Germany and the Netherlands). The starter package costs 199€ (~$240) and allows for the use of 25 SIM cards for half a year with a maximum of 500kB data throughput. It was Samsung, however, that launched the first consumer device that runs on NB-IoT in October 2017. The IoT-connected tag can be traced indoor and outdoor. While NB-IoT technology generally promises battery life for connected devices of up to 10 years, this tag is not quite there yet as it allows a maximum of just 7 days without charge. Our #1 story in last year’s review was the IoT cybersecurity attack on Dyn servers. Following that (and other) attacks, governments around the world have been looking at IoT Security legislation but are struggling to find suitable laws that can make IoT devices safer and more secure. Cryptocurrencies were undoubtedly one of the technology highlights of 2017 with the biggest one, Bitcoin, rising around 15,000% in 2017. With the rise of digital currencies, the corresponding underlying technology, blockchain, also entered the spotlight. Apart from applications in payment, distributed cloud storage, and contract administration, the technology has been linked to the Internet of Things. There are some scenarios in which smart contracts between devices and a distributed source of trust makes sense. Most notably in IoT security and in supply chain applications. A few cryptocurrencies emerged in 2017 that just focus on IoT e.g., IOTA, IoT Chain, IoT Coin. An important organization to look at will be the ‘Trusted IoT Alliance’ that launched in September 2017 with the vision to foster the development of a blockchain-enabled, trusted Internet of Things (IoT). Focusing on securing the Internet of Things, the Alliance is led by large firms such as Bosch, BNY Mellon, Cisco, Gemalto, and the U.S. Bank. Make no mistake though, according to the official roadmap a dozen of industrial Proof-of-concept projects are expected to conclude in 2020. It seems we will have to wait for results for another 2 years. 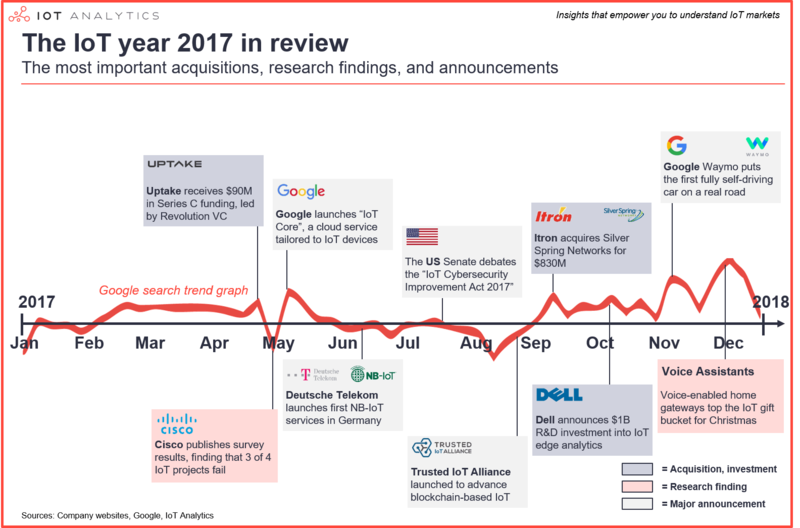 Overall, IoT-related deal volume in 2017 was much lower than in 2016. Mega-acquisitions like Softbank and ARM ($32B) or Qualcomm and NXP ($39B) that we saw in 2016 did not happen in 2017. In September 2017, US-based energy technology firm Itron, a leader in Smart Meter deployments, announced it would buy Silver Spring Networks, a specialists for mesh connectivity technology, at a price tag of $830M. While investors celebrated potential cost and sales synergies, there was likely also an IoT technology rationale: Silver Springs had seen some momentum around its RF mesh connectivity technology, a competing technology to Itron’s Zigbee-based meters. The two companies together now control more than 90M endpoints. UPDATE: After we wrote this article, French electronics supplier Thales acquired one of the leading IoT Security firms, Gemalto for €4.8M making it the largest deal in IoT 2017. There are a lot of trending topics within IoT that get widespread attention such as Security-by-design, blockchain, machines-as-a-service, 5G, IT/OT convergence. Among these trending topics we feel that “edge analytics” is the one that is evolving the quickest. Edge analytics describes a technology architecture where intelligent decisions are performed locally rather than in the cloud. This can happen on the gateway, on the device-itself or even on the sensor. Edge analytics can describe mere data stream filtering to ensure only relevant data gets sent to the cloud but it can also describe local decision-making and machine learning in real-time. In October 2017, US technology giant Dell announced that it would invest $1B into distributed edge intelligence for the IoT. Dell CEO Michael Dell believes that there will be a “Distributed Core model of computing where edge devices and systems need to respond in real time to operate effectively”. The firm has subsequently created a new organizational unit called “IoT solutions division” and has been a lead investor into startups that focus on this topic, most notably Mountain View-based Foghorn, which received a total of $33M in funding in 2017. Dell is also one of more than 50 contributors to the new open-source project “Edge X Foundry” that was launched in April 2017. Will we see “the end of cloud computing” as the world is moving towards “distributed edge intelligence”? It is a provoking claim that Peter Levine of Andreesen Horowitz raised. We, at IoT Analytics, believe that we will mostly see a hybrid design (edge and cloud intelligence) in the foreseeable future. Edge analytics will play an important role in low bandwidth and/or low latency environments such as oil rigs, mines, or factories. It will gain in further importance over time, as Moore’s law drives local storage and compute capabilities further up. However, the critical element will be the interplay between device and cloud, in which the cloud performs many of the non-critical tasks and large-scale data storage. One technology to look out for in this context: 5G. With the 5G communications technology likely becoming widely available after 2021, cloud may regain in importance due to the incredible high throughput and low latency that the technology promises. IoT 2017 saw the first (non-driver assisted) fully self-driving car on a normal road. The company that made it happen: Google. The location: Phoenix, Arizona. In our view this is the most amazing implementation of IoT-based advanced analytics and artificial intelligence (AI). It is also an excellent example of edge analytics in which machine learning functions have been moved to the camera (edge) so that the car can react instantly. Since November 2017, Google Waymo is now running a ride-sharing fleet of autonomous minivans (Chrysler Pacifica) that residents in Phoenix, Arizona can use. So far, no crashes have been reported but it should be noted that Google’s cars seem to shy away from highways at this point (perhaps because the impact of a potential accident is seen as too risky). Nonetheless, Google has reached a major milestone in the autonomous driving revolution. How did Google make it happen? Through a set of proprietary hardware and a novel simulation and testing approach. On the hardware side, Google’s engineers developed two new categories of LiDAR sensors: a short range and a long range LiDAR. On top of that, Google is manufacturing all of this hardware in-house. On the software side, Google is running an Area 51 like lab in the middle of nowhere in California which acts as a testing and algorithm training ground for the vehicles. People have reported that streets with driveways on the side as well as suburban intersections have been built just for testing purposes. The amazing development, however, is that Google has found a way to simulate car behavior on a computer, rather than on the street only. At any time, there are now 25,000 virtual self-driving cars making their way through fully modeled versions of Austin, Mountain View, and Phoenix, as well as test-track scenarios. This technology makes it possible to understand and optimize car behavior for any kind of scenario. Google may have just changed the rules of business. Through Waymo, the company has developed proprietary self-learning artificial intelligence based on IoT data that nobody may be able to copy. If that is the case, then we could see the first instance of a company controlling a market through proprietary algorithms. The Smart Home saga continues. At least for Amazon and Google. Our data for December 2017 suggests that Amazon Alexa was the #1 consumer IoT gift this Christmas. Amazon’s sales of Echo had already exploded last year (see our 2016 in review article). In the US alone, the sales of the smart speaker more than doubled again (compared to last Christmas). Amazon and Google are achieving something that many other firms had struggled with for years: Becoming the hub for the smart home of the future. In 2018, we will see a number of other firms that want to fight for that spot in the home. Most notably, Apple with the HomePod and Samsung with Bixby. Smart speaker manufacturers such as Harman Kardon Invoke and Sonos One are also joining the fight. Both Amazon and Google are trying to hold on to their early leads – Amazon introduced new devices with screens in 2017 (Amazon Echo Show, Amazon Echo Spot) and Google added new features such as free landline calling, a TV interface, and proactive notifications. Building on what happened in IoT 2017, we will publish our IoT predictions for 2018 on January 9, 2018. If you are interested in a deeper look at current IoT markets, you may find the State of the IoT 2017 report helpful which was published in December 2017 (subscriber-only content). Our IoT coverage in 2017: For continued coverage and updates, you may subscribe to our newsletter. In 2018, we will keep our focus on important IoT topics such as IoT Platforms, Security, LPWA and Industry 4.0 with plenty of new reports due in the first half of the year. For a complete enterprise IoT coverage contact us for a subscription to our IoT research stream and paid content. Much success for 2018 from our IoT Analytics Team to yours!